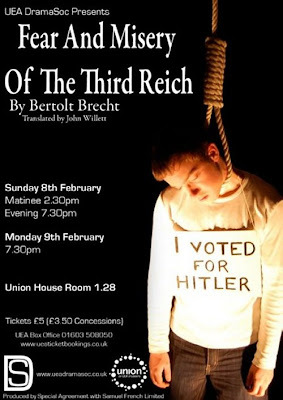 Bertolt Brecht's Fear and Misery of the Third Reich, which is being given in a student production at the University of East Anglia this weekend, was first performed in 1938 and was the playwright's first overtly anti-Nazi work. The play is structurally innovative; it is a sequence of twenty-four inter-connected playlets each depicting how the Nazi terror affected German households. Structural innovation is also a feature of a related, but little-known novel. My Argument with the Gestapo is the only surviving full-length prose work written by Thomas Merton before he entered the Cistercian Order in 1941. Autobiographical elements are combined with fiction to describe how the central character, called Thomas Merton, travels from America to England and France to report on the war with the Nazis. In fact the real Thomas Merton left England in 1935 and spent the war in America, entering the Abbey of Gethsemani, Kentucky as a novice monk in 1942. 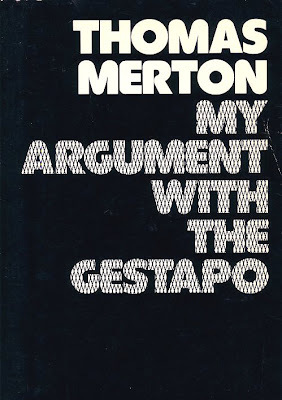 But, despite its fictitious story line, My Argument with the Gestapo is an early statement of Merton's concerns with pacifism and non-violence. It is also notably critical of Britain. "Perhaps I will go to Nevada and become the owner of a mine. Perhaps, on the other hand, I will attend the New School for Social Research, and develop a sense of responsibility, a sense of duty." Oh, anything. Facts, Graphs. Propaganda analysis. Propaganda writing. Something or other. Take a course in who's planning to murder Trotsky in his Mexican villa six years from now. Something like that. It doesn't make a great deal of difference, just so long as you feel earnest enough about it." "For us too: come on: champagne: The old chap's going off to America. Come on, what do you say, after all!" The technique of macaronic writing is used in music as well as literature: the earliest version of the carol In Dulci Jubilo (c. 1328) mixed Latin, German and Greek in its first stanza, and the original 13th century text of Carmina Burana mixed Latin with Medieval German and French. Despite a revival of interest in Thomas Merton, My Argument with the Gestapo, which was first published after Merton's death in 1968, remain overlooked. It is still in print, and my well-thumbed and battered copy of the New Directions paperback edition is seen below. It can also be perused on Google Books. My thanks go to a post on The Toynbee convector for sending me down this path. Thomas Merton put into context here.